Finally we were on our way. I looked out the helicopter window and reflected on the last three weeks working in Rangoon. Three weeks of helping to co-ordinate Merlin's emergency response, while our medical teams in the Irrawaddy Delta worked round the clock in the heart of the devastation. Three weeks of being told my permit to join our teams on the ground would arrive "tomorrow" - always "tomorrow". Now we were not only being allowed into the delta, we were being helped by the government to run a pilot needs assessment of the entire region. 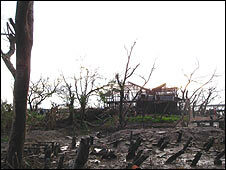 I was struck at how little devastation there seemed to be below me; palm-thatched roofs on houses; trees still standing. 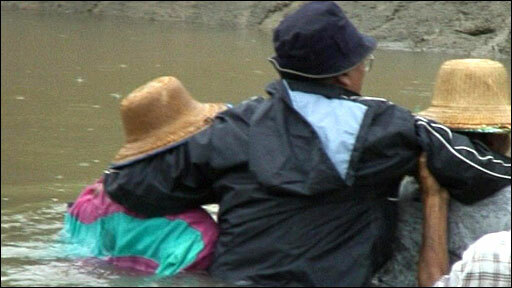 In Laputta, one of the largest towns in the delta, co-operative government officials hired us a boat and local guides. We steamed south on the large antique fishing boat to the coast of Pinsalu island, where our assessment would be based. Pinsalu translates roughly as "don't come here" and going on satellite maps and the rumour mill, it seemed indeed to be one of the worst-affected areas in the delta. I asked our guides about what had happened in Laputta and the surrounding towns during Nargis. I was again struck by how little destruction there seemed to be. One fisherman told me that in a small village to the south, four out of 500 people had been killed. I started to wonder if reports in our own press had been hugely exaggerated. But as the boat journeyed past villages standing barely above the level of the river, the destruction became more obvious. Many of the roofs were now replaced with incongruous bright orange tarpaulins. Eventually, as the river widened and we approached the Bay of Bengal where Cyclone Nargis started, I saw that scattered palms and mangroves on the banks had been stripped of their leaves and decorated to their tops with river flotsam. This was evidence that the tidal surge here had been 2-3m (7-10ft) high and the winds over 150mph (240kph). As night fell, we arrived at Pinsalu, a village bearing the same name as the island, but 3km from the coast. I could see a dog across a small stream rummaging near a dead buffalo. It was impossible not to think what other corpses might be concealed. Pinsalu had been utterly destroyed. Only the naked wooden frame of the monastery and the brick shell of the hospital were left standing. In place of the village of 4,000 was now a tented government and a camp of 500 people run by an aid organisation. 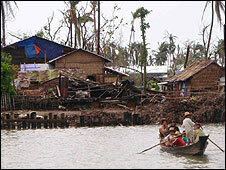 More than half the villagers had died during the cyclone. We spent the night in Pinsalu sleeping on the deck of our boat with rain, insects and images of the day preventing any real sleep. I wondered what we would find on the coast. At first light we started to walk along the desolate beach facing the open sea toward the village of Aung Hlaing. I walked away from our small group, to where the tide had deposited bodies at the top of the beach. They lay on their backs, mouths open, their skin bleached by the sun and seawater. Most of them were recognisably women and children; they had been less able than the men to swim or cling to something solid when the water surged over their heads. We waded through chest-deep mud and water and finally entered what remained of the village. Before Nargis, 580 people had lived here. Men - fishermen, monks and rice farmers - gathered round to answer questions on what they needed now. I was only able to count three women of reproductive age out of the 100 or so people who had returned to the village. Doctors are generally good at asking difficult questions and hearing difficult answers. But asking a group of 40 men how their wives and children died a month ago left me feeling helpless. Details of their stories brought life to the rumours and speculations of Rangoon. A nine-year-old girl showed me the tree she had hidden up during the storm. A man showed me scars on his back - from when he had been lashed by torrential rain. I had only a snapshot of one part of the delta but what will stay with me more than images or stories of death is the hope and sense of purpose of the people of Aung Hlaing. They were already rebuilding their lives and homes and the government was helping them in partnership with international non-governmental organisations like Merlin. While this has so far allowed people to return, and avoided deaths from epidemic disease or malnutrition, a massive and ongoing international effort is still required to prevent a second catastrophe. 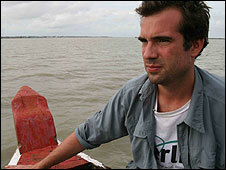 Watch Chris's report from Burma on Newsnight on Wednesday, 18 June, 2008 at 10.30pm on BBC TWO.